AIRates is a web system partnered with your local agent, that provides all costs for air shipments, with the click of your mouse. We promise that your clients will be delighted. With AIRates and our IATA global partners, you can issue e-AWB’s with the major air carriers. Be connected with over 80 airlines! 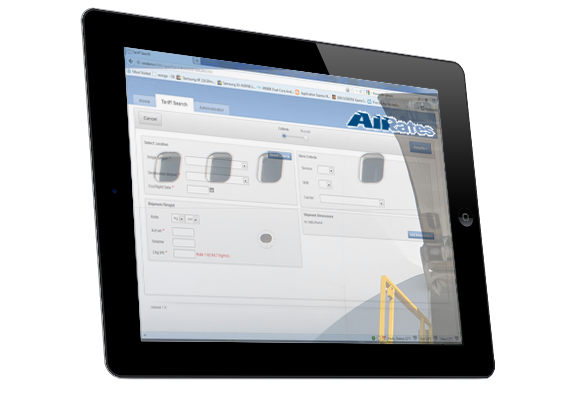 AIRates can quote your Air shipments anywhere, even when you are on the move with our iPad mobile app. All rates are online and all bookings come directly to your email. One of AIRates biggest assets is that it is fully customizable. You can choose your preferred agent, you can import and export bookings on your own data system and much more. March 2016: Executive Freight Services Ltd is our new partner in United Kingdom. Feb 2016: AIRates welcomes new IATA agent in Ireland, Central Shipping Ltd.
Download now Cargo Dimensions by AIRates ™. Now you can quote door to door shipments from anywhere you are. Download AIRates for iPad ™ from Apple Appstore. Dec 2015: We are pleased to provide COYNE Airways pricelist to IATA agents. Dec 2015: We welcome our newest agent from Turkey, that provides Air Freight services in/out of Istanbul.